Will Crown Office act after Law Society & SSDT covered up mortgage fraud case solicitor ? THE CREDIBILITY of the Law Society of Scotland's self-regulation of solicitors along with poor disciplinary procedures and cosy, secret deals in the murky world of lawyers regulating their own colleagues has yet again been brought into question after it took revelations in a Scottish newspaper of a solicitor involved in a criminal deception of a mortgage fraud to bring the case to the attention of Scotland’s Crown Office & Procurator Fiscal Service (COPFS) for an investigation. The actions of the solicitor, who falsely overstated his income to obtain a mortgage, have in previous circumstances, led to ordinary members of the public being brought before the courts and given stiff penalties for exactly the same kinds of criminal offences. It was reported in the Sunday Mail newspaper earlier this month that former Dickson Minto solicitor Alistair Cowan (37) was ‘prosecuted’ before the Scottish Solicitors Discipline Tribunal (SSDT) late last year after a complaint was made to the SSDT by the Law Society of Scotland relating to a case involving MORTGAGE FRAUD. Mr Cowan was accused of inflating details of his his annual salary as a solicitor employed at Dickson Minto to obtain a higher mortgage from the Halifax PLC. The solicitor went onto use the loan from the Halifax to purchase a £445K flat in Edinburgh’s New Town, however Cowan, now with HBJ Gateley only suffered a ‘slap on the wrist’ with a three years supervisory work order after a Law Society investigation which led to him being found guilty of professional misconduct by the tribunal late last year. Even though the solicitor’s actions clearly amounted to offences considered criminal in law, no report of the case or of Mr Cowan’s conduct was ever made by either the Law Society of Scotland or the Discipline Tribunal to the Police or Scotland’s prosecution service, the Crown Office, raising more questions over why the dark world of self regulation of Scottish solicitors, administered by the Law Society of Scotland & Scottish Solicitors Discipline Tribunal appear to consistently avoid any reporting of offences of a criminal nature committed by solicitors to Scotland’s prosecuting authorities. Some have now also questioned by, even with the Law Society of Scotland being represented at the tribunal hearing by its ‘Fiscal’, part-time Sheriff Paul Reid who is also a solicitor in private practice of Glasgow Law Firm Fleming & Reid, and receives a daily fee paid out of public finds of around £583 for each day of service in court. Sheriff Reid, who recently featured in a Scottish Law Reporter investigation which reported on his role as a solicitor in defending Scots QC Desmond Cheyne from claims of unpaid building work debts, is known to have a record of stiff sentencing of members of the public in all manner of criminal trials, however no report of the case involving the mortgage fraudster solicitor managed to filter through to the Crown Office from anyone connected with the SSDT hearings including the Sheriff himself. This was confirmed when Crown Office admitted to the newspaper they had no record of the case. It is unclear what level of guidance if any exists from the Judiciary of Scotland for their members (judges & sheriffs) who appear in what are effectively closed door ‘private prosecutions’ brought by the Law Society of Scotland before the Scottish Solicitors Discipline Tribunal. However if a member of the Judiciary of Scotland has knowledge of a criminal offence, certainly it would be expected of them to report the matter to the appropriate authorities, something which did not occur in this case. At Kirkcaldy Sheriff Court on 28 February 2012, a Confiscation Order for £35,000 was made against Anzelika Trifonova (DOB 01/02/1980 or 01/12/1980). Trifonova, a Latvian national living in Rosyth, had previously pled guilty to a common law mortgage fraud. She was sentenced to 250 hours community service. Trifonova was found to have made £86,000 from the mortgage fraud. Lindsey Miller, Head of the Serious and Organised Crime Division (SOCD) and the current POCA champion, said : "Anzelika Trifonova lied about having a job in order to gain a mortgage worth £85,500, and in doing so, made a significant amount of money from crime. The Crown takes mortgage fraud extremely seriously, and will seek to recover any money made in this way using its powers under Proceeds of Crime legislation. Ms Trifonova is the latest in a long line of criminals who have discovered that they will be forced to pay back the money they make through crime. This should act as a warning to others considering committing crime. The money recovered from Ms Trifonova will now be added to the millions of pounds taken from criminals via the Proceeds of Crime Act, and will be reinvested in activities for young people through the CashBack for Communities programme." At Glasgow Sheriff Court on 1 february 2012, a Confiscation Order for £75,000 was made against Edward Lyons (DOB 14-02-1958). Lyons, from Glasgow, had previously pleaded guilty to two mortgage frauds and transferring criminal property. He was sentenced to 300 hours community service. The mortgage frauds were committed when the accused obtained two mortgage loans by falsely claiming that he was self-employed and in receipt of a salary well in excess of his actual earnings. The transfer of criminal property took place when he used money gained through the mortgage fraud to give a £30,000 gift to his daughter Ashley Lyons. Lindsey Miller, Head of the Serious and Organised Crime Division (SOCD) and the current POCA champion, said : "Edward Lyons committed two mortgage frauds and transferred criminal property, both of which are serious offences in themselves.Transferring criminal property is classed as a "lifestyle offence" under the Proceeds of Crime Act - allowing the Crown to investigate his income over the six years preceding his arrest. The court found that £148,793.71 of his income during this time could not be accounted for legitimately. We are satisfied that the £75,000 confiscation order represents the amount of money available to us from Lyons at this time. We can also apply to the court to vary the amount of the order should further funds become available, and we intend to make full use of this power. Mortgage fraud and the subsequent laundering of the associated free proceeds is often seen by criminals as an easy way to make money. This case should act as a reminder that the Proceeds of Crime legislation is wide-ranging and by committing lifestyle offences under POCA, criminals throw open their entire financial dealings over six years to detailed investigation by forensic accountants, lawyers, and ultimately the court." A Confiscation Order is an order made by the court following criminal conviction, to pay a fixed sum of money from the proceeds of crime. An application for confiscation is one of the tools at the disposal of the Crown under the Proceeds of Crime Act 2002 and Proceeds of Crime (Scotland) Act 1995. The Serious and Organised Crime Division works together with colleagues at the Civil Recovery Unit, and other law enforcement agencies, such as the Scottish Drugs Enforcement Agency, UK Police Forces, HM Revenue and Customs and Department for Work & Pensions (DWP) to identify and recover the proceeds of crime. Proceeds of Crime legislation is also used by the Civil Recovery Unit acting on behalf of Scottish Ministers. The Civil Recovery Unit investigates and recovers the property realised through criminal activity of individuals, in the civil courts without the need for criminal conviction. Money recovered under the Proceeds of Crime Act is invested by Scottish Ministers in community projects aimed at alleviating the effects of crime. To date, more than £60 million has been invested in a range of activities for young people through the CashBack programme. Asked if a proceeds of crime confiscation order should be applied in any cases of mortgage fraud no matter the profession of the individual charged with committing the offences, the Justice Department insider replied “Yes”. A PROPERTY lawyer who lied about his income to get a ­mortgage has avoided ­prosecution for fraud. Alastair Cowan, 37, told the Halifax he earned £130,000 when he made £80,000 at ­Dickson Minto in Edinburgh. Cowan made the claim in a letter signed by an unnamed partner in the firm. He used the loan to buy a £445,000 flat in Edinburgh’s New Town. Dickson Minto discovered the scam during a probe into another employee but Cowan left the company as a result. 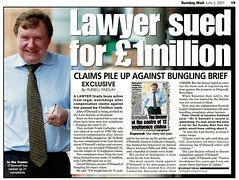 They reported him to the Law Society of Scotland, who sent the case to the Scottish ­Solicitors’ Discipline Tribunal. Cowan admitted professional misconduct and the SSDT ordered him to work under supervision for three years with his new firm HBJ Gateley. In 2010, crime clan boss Eddie Lyons was given 300 hours’ community service after admitting two mortgage frauds. The Crown Office said they had no record of Cowan’s case. Neither Dickson Minto nor Cowan returned our calls. SLCC’s Investigation into Law Society’s conduct complaints system ends up in missing final report. AN INVESTIGATION carried out by the Scottish Legal Complaints Commission (SLCC) into the Law Society of Scotland's Conduct Complaints Process under powers the Society itself helped to frame in the Legal Profession & Legal Aid (Scotland) Act 2007 which created the SLCC has unsurprisingly resulted in the board of the hapless anti-client law complaints quango claiming it could take “reasonable assurance” in the Law Society’s overall complaints handling system, despite the fact the Law Society, SLCC and several solicitors continue to be locked in expensive courtroom battles in Scotland’s Court of Session over which of the two regulators has jurisdiction in complaints investigations. Curiously however, while the announcement from the SLCC claimed the Law Society’s “processes, procedures and controls under review could benefit from a number of improvements”, no full report on the actual review has been made available to the public or media, and neither has any final report been published on the SLCC’s website, leading to concerns from some campaigners the SLCC and Law Society are operating on a closed shop loop, branded this morning by one Glasgow based campaigner as a “lawyer’s merry go round cover up society which does nothing for transparency or openness”. The announcement from the Scottish Legal Complaints Commission, states that in November 2011 the SLCC concluded a review of the Law Society of Scotland's Conduct Complaint Process under its powers set out in section 36(5) of the Legal Profession and Legal Aid (Scotland) Act 2007. The review concluded that the SLCC Board could take 'reasonable assurance' in the Law Society's overall complaints handling system but recognised that the processes, procedures and controls under review could benefit from a number of improvements. *Policies and procedures, including the Complaints Investigation procedures manual, should be finalised. *Defined timescales and Key Performance Indicators should be established. *An effective version control system should be implemented for key documents. *The quality assurance process should be formalised and reviews documented. *Management information on complaints could be refined, including the use of trend analysis. 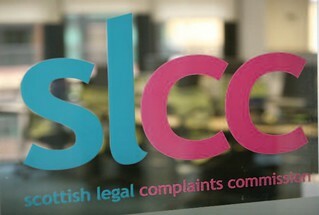 However, no reports of discussions between the Law Society & SLCC have been published on the SLCC’s website, possibly due to claims from Commission insiders there have been “difficult moments” between the regulators during the review, and alleged insistence from the Law Society of Scotland the SLCC should not publish ‘certain material’ gathered during the review. No one from the Scottish Legal Complaints Commission has issued any further comment on the review of the Law Society’s Conduct Complaints Process, and no statement has been issued by the Law Society of Scotland, leading observers to conclude the SLCC’s review was not a happy affair, leading in turn to the lack of published material on conclusion of the ‘independent’ law quango’s investigation of the Law Society’s conduct complaints system. While the SLCC appear to have held back from criticising the Law Society over its closed shop complaints procedures, Court of Session judge Lord Carloway did not mince his words, claiming an opinion issued at the Court of Session last week the Law Society’s complaints procedures were failing to protect the public, after it emerged the Law Society had taken over a year to send a misconduct complaint to the SLCC about a case where Greenock solicitor William Murnin was alleged to have a “potential” £232,000 deficit in his firm’s client accounts. While neither the Law Society of Scotland or Scottish Legal Complaints Commission were able to explain to the court the year long delay in the Law Society’s reporting of the complaint to the SLCC, claims emerged last week from legal insiders ‘“there were negotiations going on between the Law Society & ‘representatives’ of Mr Murnin between January & June of 2011” a pattern reminiscent of previous cases where solicitors have asked their colleagues, and solicitors working for the Legal Defence Union to intervene in complaints investigations and secretly bargain away any disciplinary action or overt publicity which may impact on their professional livelihoods. The allegations, put to one Law Society insider, have not been refuted. Law Society & SLCC criticised by judge amid concerns over dodgy complaints procedures. SENIOR Judge Lord Carloway of Scotland’s Court of Session has criticised the Law Society of Scotland's "inadequate system" of dealing with complaints against solicitors after failures & delays were revealed in a Law Society investigation of Greenock solicitor William Murnin, who has been suspended from practising as a lawyer since 22 July 2010 after a Law Society audit discovered a “potential” £232,000 deficit in the solicitor’s firm's client account. 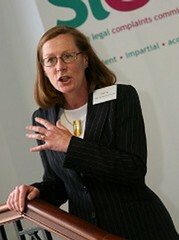 It took the Law Society of Scotland over a year from May 2010, when they began their investigation, until June 14 2011 to submit the complaint to the Scottish Legal Complaints Commission (SLCC), which in turn led to the accused solicitor launching an appeal against the SLCC’s consideration of the complaint, on the grounds it was referred to the SLCC outwith its one year rule. Reflected in the court’s opinion on the case, issued earlier this week, solicitor William Murmin had been accused of overcharging clients and was the subject of a lengthy investigation. The Law Society of Scotland’s Guarantee Fund Committee eventually met in January 2011, nearly a year on from the Society’s investigation into the solicitor and decided to make a complaint to the SLCC. The complaint, which was not submitted to the SLCC until June 14, some six months on from the Guarantee Fund Committee’s meeting, said Murmin "may be guilty of professional misconduct or unsatisfactory conduct regarding alleged breaches of the Solicitors (Scotland) Accounts Rules 2001 through overcharging of fees to various client ledgers so creating a deficit on the firm client account". The Court’s opinion reports that An allegation of misconduct was made against the appellant in relation to events occurring before 18 May 2010, when a financial compliance inspection of the appellant's firm by the second respondents revealed a potential deficit on the firm's client account of about £232,000. The second respondent's Guarantee Fund Committee met on 13 January 2011 and determined to make a complaint. The appellant was advised of this on 10 March, but the complaint was not submitted to the first respondents until 14 June 2011. The complaint form, which was intimated to the appellant, read simply that the appellant: "may be guilty of professional misconduct or unsatisfactory conduct regarding alleged breaches of Rules 4 and 6 of the Solicitors (Scotland) Accounts etc Rules 2001 through overcharging of fees to various client ledgers so creating a deficit on the firm client account". However, it was accompanied by a letter which stipulated the amount involved and that the sum was made up of overcharging on thirteen different client files. It also gave some information on the background, including the date of the inspection, the invitation to the partners of the firm, including the appellant, and then to the appellant alone, to attend the Committee interviews on 1 and 22 July 2010. The appellant had not attended these interviews and, on the latter date, his practising certificate was suspended under section 40 of the Solicitors (Scotland) Act 1980. Further details of the Committee meetings in September, October, November 2010 and January 2011 were given; it being said that it was at the final meeting that a decision was made to make the complaint. The accompanying letter was not copied to the appellant but it is not disputed that he was aware of the nature and extent of the allegations summarised in the complaint form. By letter dated 24 June 2011, the first respondents intimated to the second respondents their intention: "to make a decision not to accept the complaint for investigation on the grounds that it has been made outside the time limits". They invited a response on this and, in particular, whether: "There are exceptional circumstances that prevented you from submitting your complaint earlier...". A similar, but not identical letter, was sent to the appellant intimating the first respondents' intention and requesting any comments before any decision was made. It stated that the second respondents had been asked to outline: "any exceptional circumstances which prevented them from submitting the complaint at an earlier stage". The appellant made no comment. By letter dated 28 June 2011, which was not copied to the appellant, the second respondents submitted that "the subject matter to which the complaints pertain is of such a serious quality" that the first respondents ought to exercise their discretion to allow the complaint to be considered given the "overwhelming public interest in investigating these matters". There was no explanation proffered for the lateness of the complaint. "However, the [first respondents are] mindful of the severity of the allegations and the need to protect the public should the petitioner's practising certificate be reinstated. In the circumstances, the [first respondents recommend] that the need to establish the specifics of the complaint and the gravity of the allegations should be considered to be an exceptional reason for accepting the complaint even though it has not been made within [the first respondents'] time limits". The solicitor, William Murmin, formerly of Murmin McCluskey in Greenock, then lodged an appeal on the grounds the Scottish Legal Complaints Commission had erred in law in holding that, on a proper construction of Rule 4(6), a bare and unsupported assertion by the second respondents, that the misconduct complained of was grave, was sufficient to amount to exceptional circumstances, thus allowing the SLCC to investigate the case outwith its one year rule. The appeal, heard earlier this week by Lord Carloway, Lord Hardie & Lord Wheatley was refused, with the issue of expenses expressly reserved. While Lord Carloway recorded in his opinion that no explanation for the delays was offered to the court, legal insiders have told Diary of Injustice this morning of allegations “there were negotiations going on between the Law Society & ‘representatives’ of Mr Murnin between January & June of 2011”, a pattern reminiscent of previous cases where solicitors have asked their colleagues, and solicitors working for the Legal Defence Union to intervene in complaints investigations and secretly bargain away any disciplinary action or overt publicity which may impact on their professional livelihoods. The allegations, put to one Law Society insider, have not been refuted. No statement has been issued on the Law Society of Scotland’s website at time of publication. However, the Scottish Legal Complaints Commission late today issued the following statement, praising the court for its decision yet ignoring Lord Carloway’s ‘concerns’ the SLCC exercised its “discretion to entertain the complaint outwith the time limit”. The SLCC also claimed it had acted in the public interest in the Murnin case, although as previous coverage in the media seems to indicate the SLCC has refrained from acting in the public interest 99% of the time with regard to complaints made by clients about their solicitors to the hapless law quango. SLCC Chair Jane Irvine, pictured finger-pointing on the SLCC’s multi million pound stairwell at its plush location in the Stamp Office, Edinburgh. Speaking after the ruling was issued, Jane Irvine the Chair of the SLCC stated "This is an important decision for the SLCC. Not only does it recognise that we are making sound decisions in the public interest, it also recognises the vital role the SLCC has in the monitoring and regulation of the Scottish legal profession." The SLCC statement pointedly failed to give any further information on why the complaint took over a year to send to the SLCC, information, which Commission insiders allege “is well known to some senior staff and members of the SLCC’s board”. Clearly however, this case demonstrates yet again there is NO SAFETY in clients allowing their solicitors to hold funds in client accounts. Clients are, and have been previously advised to withdraw any funds being held by or administered by Scottish solicitors, on the grounds the Guarantee Fund and the Law Society’s arrangements for detecting fraud & compensating clients for financial losses as a result of their solicitors actions, are wholly inadequate. Legal Ombudsman for England & Wales now operating naming & shaming policy. CROOKED LAWYERS operating in England & Wales who are being investigated over complaints from clients and law firms who are considered ‘serial offenders’ in their poor treatment of clients & consumers could now be publicly identified by the Legal Ombudsman (LeO), even if the complaint is yet to be decided, according to an announcement made earlier this week by the independent regulator of complaints against the legal profession south of the border. The policy, popularly known as ‘naming & shaming’ has taken well over a year for the LeO to implement after several consultations took place amid bitter arguments and veiled threats from the legal profession, who are worried consumers may end up seeing a different ‘warts, complaints, swindling, corruption & all’ view of lawyers other than the carefully manicured image projected by the Law Society and the UK’s legal services industry. Speaking on the LeO’s plans to publish complaints data & the identities of law firms who perform poorly for clients, Elisabeth Davies, Chair of the Legal Services Consumer Panel (LSCP), said last year : “Research shows that UK consumers are now leaving well over 100 million comments online every year about their experience with businesses across the economy. Lawyers cannot escape this welcome emergence of consumer power, but instead should seek and then use such feedback to improve the service they offer. * Whether the complaints tend to come from private or publically funded cases. Diary of Injustice has been following the Name and Shame debate in England & Wales and it should not be forgotten the Law Society of England & Wales has, at rumoured costs of up to half a million pounds, used the courts to silence private individuals efforts to set up websites naming & shaming ‘crooked lawyers’, the most famous of which was Rick Kordowski’s Solicitors from Hell website. While consumers of legal services in England & Wales are expected to benefit from the tough stance on naming & shaming taken by Adam Sampson, the Legal Ombudsman, there are no equivalent statutory moves being made in Scotland by the Scottish Legal Complaints Commission (SLCC) to name & shame many of Scotland’s ‘serial rogues’ from the legal profession who regularly get away with a slap on the wrist or secret shady deals done between the SLCC, Law Society of Scotland & the Legal Defence Union. No one from the Scottish Legal Complaints Commission or the Scottish Government was available to comment on the lack of public information available about Scottish solicitors’ regulatory history, however a former Law Society Council member speaking to Diary of Injustice indicated any moves to name & shame ‘crooked lawyers’ in Scotland “will be fiercely resisted by the Law Society of Scotland”. The insider also suggested any moves made in petitions to the Scottish Parliament or pleas to the Scottish Government to amend legislation to enable the SLCC to identify solicitors who are the subject of complaints “will be lobbied against by the Law Society of Scotland”. Misplaced trust with complaints : Philip Yelland. Philip Yelland, the Law Society of Scotland’s director of standards, previously director of regulation and before that head of the Law Society’s “Client Relations Office” has been in charge of regulating crooked lawyers in Scotland for over TWENTY YEARS yet from Penman to the present and beyond, most crooked Scottish lawyers have either received a slap on the wrist or no punishment at all while the client ends up financially ruined and excluded from the courts to make sure justice can never be done. Would you trust anyone like this with your complaint ? Make sure you use the media first before trusting the Law Society or SLCC with your lawyer problems.